Agricultural Economic Insights March Madness: Did Your County Yield Put You on the ARC-CO Bubble? With March Madness right around the corner many prognosticators will be talking about teams on the NCAA tournament bubble. In the case of ARC-CO many counties are also on the proverbial program payment bubble. Back in December we had cautioned farmers, bankers, and anyone else interested in farm program payments to wait for the county yields before penciling a large ARC-CO payment into their budgets. A large portion of that uncertainty was resolved last week when the National Agricultural Statistics Service (NASS) released their initial estimates of the county yields for corn and soybeans. 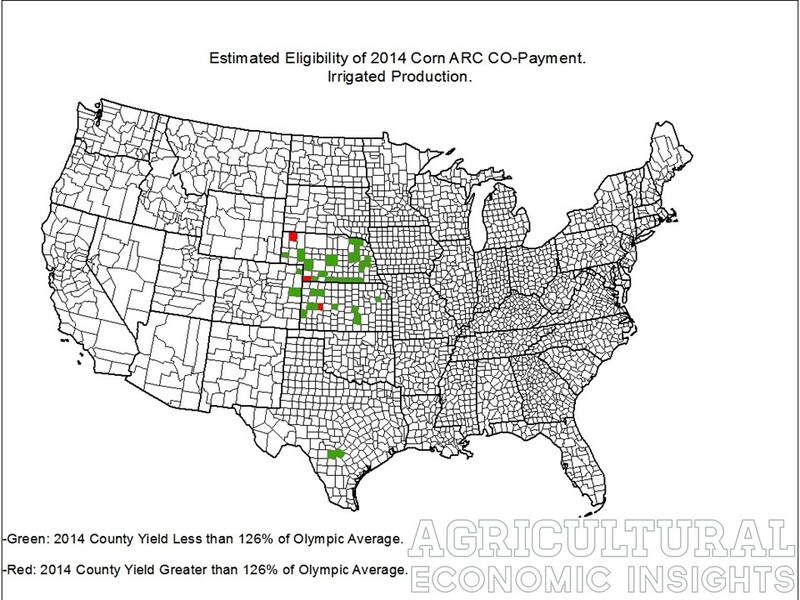 The group at Farm Doc Daily recently used these yields to produce estimates of ARC-CO payments. Rather than focusing on the size of the payment, we thought it would be interesting to discuss the yield variability across the U.S. and how that will influence the payments. The reason that yields are important is that ARC-CO is a revenue based program. So even if prices are low, yields could theoretically be high enough to produce a situation where the county revenue is above its benchmark. ARC-CO builds in an explicit relationship between the county yield and the market-year average (MYA) price when calculating payments. Let’s assume that the MYA price for 2014 ends at $3.60 per bushel. At this price, counties with yields greater than 126% of their Olympic average will not qualify for a payment because their revenue would exceed the revenue benchmark. This is determined by dividing 86% of the benchmark price by the projected MYA price for 2014 ((86%*$5.29)/$3.60 = 1.26). This leads to the obvious question of which (and how many) counties had yields so outstanding relative to their Olympic average that they are unlikely to receive 2014 payments? Like every year, there is considerable yield variation across the country. Although 2014 resulted in a historically high national corn yield, there were clearly regional differences in yield. When it comes to the ARC-CO program payment, this county level yield variability is important. In figure 1, county eligibility for an ARC-CO payment assuming a $3.60 MYA price was estimated using NASS county yield data. The counties in red are those whose yields exceeded 126% of their Olympic average. In total, 32% of the counties colored in the map out-yielded the revenue guarantee at this price level. For these counties to receive an ARC-CO corn payment, the MYA price would have to fall below $3.60 (with the caveat that our use of the actual NASS yields likely means that a few of these counties might qualify for small payments even at a $3.60 MYA price). Figure 1. Estimated ARC-CO 2014 Payment Eligibility at $3.60 Market Year Average Corn Price. The ARC-CO program specifies that in some counties payments will differ depending upon whether land is irrigated or non-irrigated. In figure 1 we only show counties in the 30 largest corn producing states that lump irrigated and dryland production together. Blank counties either had no data or were split practice counties. For the counties with irrigated and non-irrigated splits, those maps can be found here and here. Data was not available for counties in white. As one can see, the counties that out-yielded the price decline tend to be in the Southern half of the U.S. If one draws a horizontal line about 2 counties north of Iowa’s Southern border, most of the counties that out-yielded the ARC-CO guarantee are south of it. In other words, the yields that were truly high relative to their history tended to be in the southern corn growing areas. For these counties to receive ARC-CO payments, prices would have to fall further (again we provide the caution that the use of NASS yields means some counties with yields slightly above 126% of the benchmark will likely be eligible for small payments at a $3.60 MYA price). One of the natural questions that would arise from the previous figures is how close are some of these counties to being eligible for a payment or how many are on the bubble? A major assumption in Figure 1 was the $3.60 MYA price. Any change in this price (or the county yields) could move a county on “the bubble” in, or out, of range for a payment. We considered this in Figure 2, which shows each county’s yields relative to their ARC-CO 5 year Olympic average. The dark blue counties are those in which yields were at least 140% of the 5 year average. These counties with truly exceptional 2014 yields represent 17% of the counties shown in the map. Many of them were located in Southeastern Kansas, Missouri, and South Iowa. Farmers in counties with yields at this level would not receive a payment unless the MYA price fell to $3.25 or lower. Figure 2. 2014 County Yield Relative to 5 Year Olympic Average Corn Yield. Illinois and Indiana have many counties that are in the 121% to 140% relative yield range. These yields are also very high relative to normal, but some of these counties may qualify for payments if prices were to fall or FSA yield adjustments were large enough. One can also observe that although the national yield was a record, yields in several Minnesota and Northern Iowa counties were at or below their 5 year Olympic average. About 14 percent of the counties in the map had yields below their benchmark. These counties will benefit from the revenue protection aspects of the ARC-CO program. Rather than worrying about out-yielding the guarantee, these counties will collect payments that compensate them both for below average prices and yields. Given the below average yields, most of these counties will hit the maximum ARC-CO payment limit. 2014 was certainly an exceptional corn growing year for the U.S., but this was particularly true in the southern regions of the corn-belt. Many of these counties had yields high enough to out-yield the ARC-CO guarantee. The extent of the yield variation is quite interesting. About 17 percent of the counties in the top 30 corn producing states had yields in excess of 140% of their 5 year Olympic average yields and 32% were above 125% of their average. As one would expect, when looking at the counties with irrigated production splits, the variability was less. So far, only 1 county (not all the data is available at this time) had a yield greater than 140% of the benchmark and 7% had yields greater than 125%.